For every style, design, and color roof, there is a metal roofing option to match. We have come a long way from the standard tin roof. If you’re looking for shingles, but don’t want asphalt, there is a metal roofing alternative called metal shingles. There are also several other metal roof types, like standing seam metal roof, metal shingles, and metal tiles. Typically, a steep slope roof pitch is the ideal candidate for a metal roof, but most situations still qualify. All of these options come in different colors and styles to match the exact design you are looking for. Our pros at Modern Roof Co will get you the roof you’ve always dreamed of. Not only will your metal roof last longer than a standard asphalt shingle design, but is also completely recyclable. If environment-friendly roofing is on your mind, metal roofing is the way to go. Modern Roof Co is quality certified by the Metal Roofing Alliance. We uphold the quality code of practices and match standards of product quality and installation laid out by the MRA. As a homeowner or property owner, you want to work with a company that is certified to do quality work. 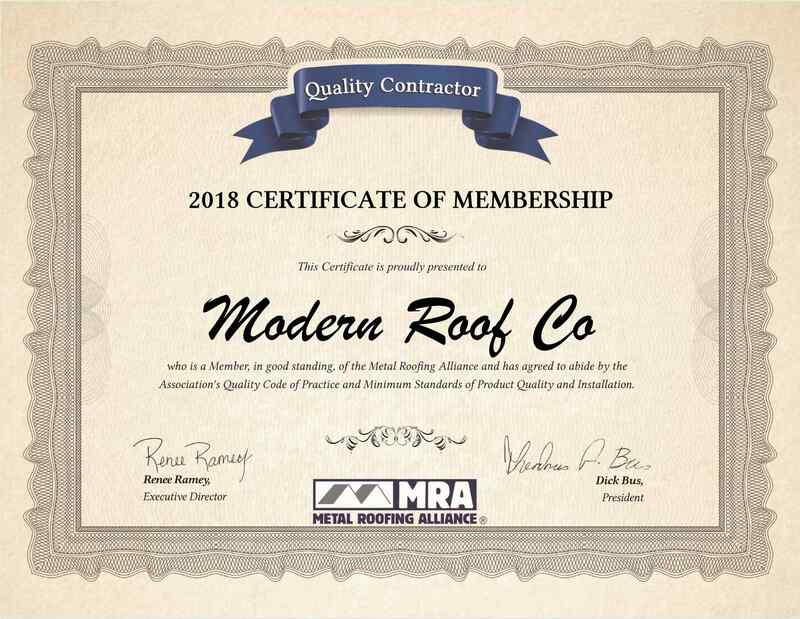 Modern Roof Co is proud to follow the MRA standards and practices and will build you the metal roof you have been looking for. Contact us to get started today. Asphalt shingles are the most common roof system in America. Nearly every residential and multi-family property utilizes asphalt shingles because they are a cost-effective and quick solution to protect the roof. They are not the only option, however. 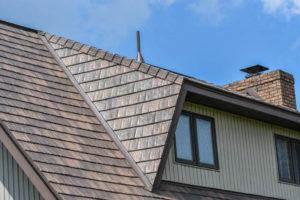 In the debate between metal roofing vs shingles, the major factor comes to cost. Metal is more expensive than asphalt shingles, clay tiles, and wood shake. The reason is that metal provides benefits that other roofing systems can’t provide. Comparing metal roofing vs shingles is something to consider for a new roof. Knowing all of your options is essential to choosing what fits in your budget and expectations. Our project managers are more than happy to share their knowledge with you and will help you decide how to move forward. Comparing metal roofing vs shingles is something to consider for a new roof. Knowing all of your options is essential to choosing what fits in your budget and expectations. Known for strength and durability, steel is an easy choice for metal roofing. Steel metal roofing is the most popular metal roof type and comes in all styles. Most metal roofs with a steep slope roof pitch utilize steel as the material. Metal shingles, metal tiles, metal shake, and standing seam can all use steel as the material. Steel roof types are also low cost because of how prevalent steel is in our society. We know when you hear metal you think rust, but that’s not the case. To prevent rust, a metallic coating goes over the steel, dramatically increasing its corrosion rating. The two popular options for steel roofs are galvanized steel and galvalume. The aluminum roof type has a long list of benefits. Aluminum roofing is rustproof, highly pliable, extremely long lasting, and made almost entirely of recycled materials. All those thrown out soda cans are now on your roof. Aluminum is also lighter than steel making it ideal for buildings with heavy snowfalls. 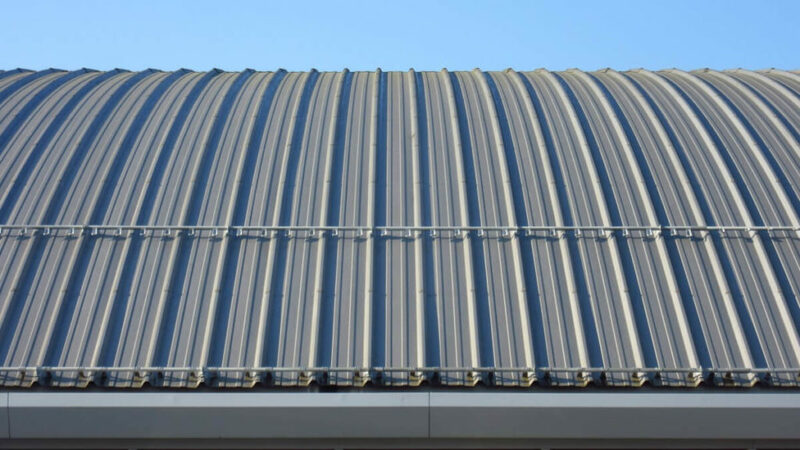 With the natural corrosion resistance, aluminum metal roofing is a popular choice for buildings in constant contact with water or snow. 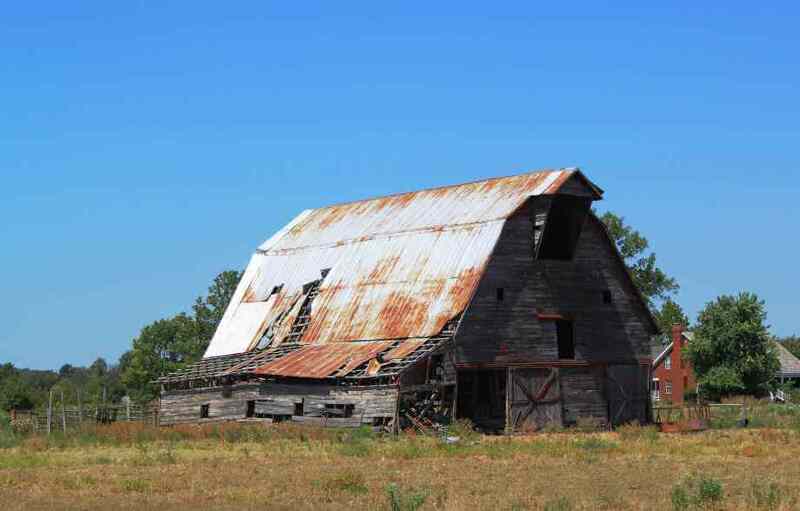 The tin roof style is outdated and is rarely used in today’s modern metal roofing. Today, some of the only places left using a tin roof are rustic bars and maybe a few dog houses. It is considered fragile and there are stronger options available at the same or lower prices. If you’re interested in the tin roof style, without the disadvantages of using tin, check out Natural metal roofing to get that aged look. Copper and Zinc provide a natural metal look that captures the eye and inspires awe. Over time, the look gathers a patina (that blue-green look) that adds to its beauty. 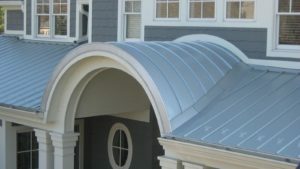 These style of roofs can be more expensive, but continue to offer the investment grade advantage as other styles. 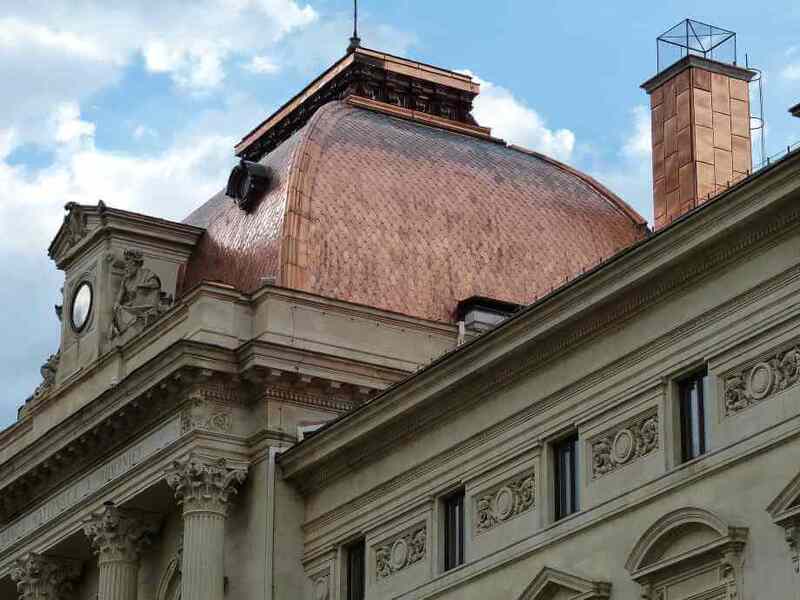 The patina offers further resistance against corrosive elements, thereby extending the lives of copper and zinc roofs. 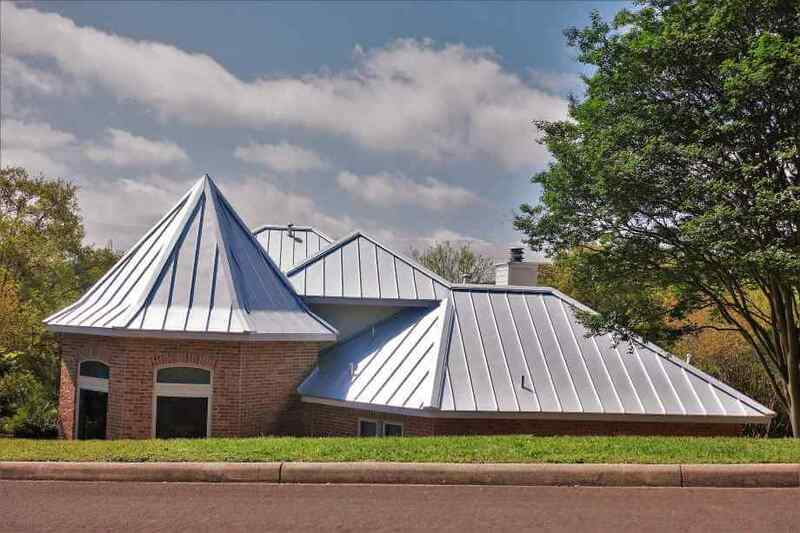 Often used in historical and landmark settings, natural metal roofing gives your roof and property a luxurious look that will last for decades. There are several considerations when using a copper or zinc roof. Contact us to discuss options and get further details. Standing seam metal roofs use a pattern of ridges or grooves on metal roofing sheets. This style uses vertical panels to create a smooth look for every roof pitch. It is called standing seam because each panel fully interlocks with the adjacent with a single ‘standing’ seam that opens and folds into place. This is a traditional style that has yet to lose its appeal. The classic look is great for your residential home, but is also useful for multi-family complexes such as apartments and hotels. In Colorado, standing seam is a popular option because of its durability and ability to shed snow and water. 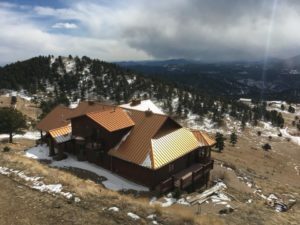 Many buildings in places like Vail, Beaver Creek, and Winter Park, use standing seam to withstand the harsh weather conditions in the Rocky Mountains. Recoloring standing seam is a low-cost way to fit new paint schemes and trends without replacing the whole roof. As with all metal roofing, metal shingles are investment-grade roofing. The style creates a classic shingle or slate look without using asphalt or stone. Metal shingles are also lightweight enough to fit over an existing shingle roof system. 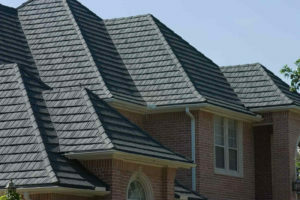 They come in all the same colors as traditional shingles with several added benefits. There is substantially higher wind resistance, lightweight, a variety of colors and grain patterns, and long-lasting durability. Metal tiles are more durable than clay tiles. They retain the look of a tile roof without retaining any of the cracks or decay that can come with a traditional tile roof. A high roof pitch can present a problem to clay tiles, but with metal tiles, you don’t have to worry. Each section interlocks with the next. Now you can get that cool Mediterranean look while investing in a long-term roof. 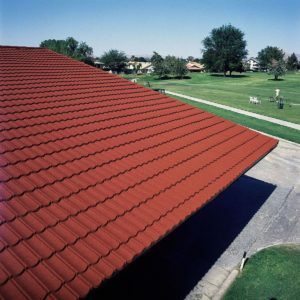 Metal roofing tiles come in several color options to match the perfect style you’re looking for. Clay tiles are heavy, fragile, and maintaining them can be a pain. Metal tiles give you the gentle curves and bright colors with a strong yet light steel. Traditional wood shake roofing has some drawbacks. It is susceptible to rot, mold, and has a short life if not maintained properly. Metal shake gives you the same look as wood shake without the negatives. When you choose metal shake for your metal roofing, you are investing in your property. Not only will this shake style metal roofing last up to ten times longer, but it protects your roof from dangerous weather. Investment grade roofing is a major factor when you know you want a shake roof, but don’t want to replace it every five years. Metal shake will look like wood, but not act like wood. You’ll get a return on your investment the moment it touches your roof. We provide all of your metal roofing needs. Want a copper roof? We can do that. Need an aluminum roof for your nest egg in the mountains? Look no further. Modern Roof Co will give you a metal roof that will last for decades to come. Contact us to discuss your options.